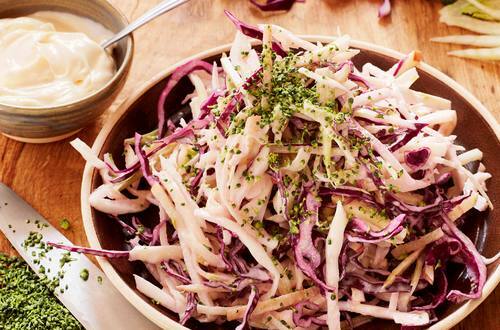 Coleslaw so colourful it’ll make you sing. And so full of good ol’ fashioned Southern charm that it’ll get you back for seconds. 1 Thinly slice the apple, broccoli stem, fennel, red cabbage, white cabbage. 2 Mix in with Hellmann’s Olive Oil. 3 Season with salt, pepper and lemon juice. Skip the salt, it's already delicious without!